The Lotus World. The lotus is the symbol of manifestation. Krishna (Purusha) is seen as separate, detached, because of his knowledge: 'She is Sakti.' 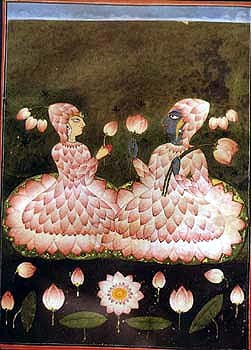 "Hladini (Beauty of the World) is seen by me" Radha (Sakti, Prakritti) is separate because of her knowledge: 'I am seen.' Where there is no longer duality for the sake of creation, there is total Unity.